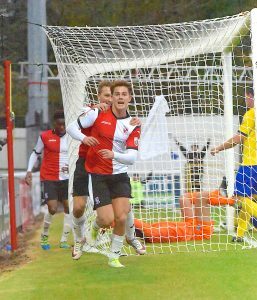 WOKING FC boss Anthony Limbrick will be hoping his side’s showing in this year’s FA Cup will spur them on against Maidenhead United in the First Round of the FA Trophy on Saturday (16 Dec ‘17), writes Andy Fitzsimons. The three-time FA Trophy winners will be looking to rekindle that old flame when they entertain Maidenhead for the second time in four weeks. Under the stewardship of former West Ham United favourite Alan Devonshire, The Magpies have been transformed from a mediocre National League South side, into one that is more than holding its own in the National League top-flight division. Currently, the east Berkshire side lie just two points behind Woking in the table, having played 24, won seven, drawn 10 and lost seven. Charlie Carter scored in the 1-1 draw against The Magpies in November ’17. Picture by Andy Fitzsimons. And many Cards’ faithful will be hoping that last month’s less than inspiring 1-1 draw at The Laithwaite Community Stadium will be given a cup makeover to help Woking come out on top to book their place in Monday’s second round draw. Speaking to the News & Mail ahead of the tie, Limbrick was upbeat about the prospect of facing The Magpies again so soon, and knowing that his side have a realistic chance of progressing through to the latter stages of the competition. Other than on-loan Chelsea goalkeeper Nathan Baxter, who is still recovering from a foot injury, The Cards’ supremo is expected to name a nigh on full-strength squad with the FA Trophy showdown, with Chez Issac (suspended) and Regan Charles-Cook (cup-tied) both returning to the fray after The Cards’ 5-2 defeat against Peterborough United in midweek (12 Dec ’17). Bobson Bawling, meanwhile, is not expected to return to action until the New Year. “The Trophy has a good history and it gives us a realistic chance to try and get to Wembley. “It’s a competition we will be taking seriously and play our best available side at any time of the competition. “There’s no two ways about it, Maidenhead are a very organised and hard-working side; Alan Devonshire has obviously got them really focused on defending and being hard to beat coming into the National League. “We when played them last month, it was a tough, hard-fought point. It wasn’t the most exciting game we’ve been involved in, but we probably had the better changes to win the game, so we’re be looking to put that right at home on Saturday. “We’ve only lost two in 14 league and FA Cup games at home so far, so we’ll be looking forward to playing in front of our own fans again and, hopefully, get through to the next round,” he added. With £6,000 up for grabs to all first round (proper) winners, Woking will be keen to progress in this year’s Trophy competition and not come up short like they did against Ebbsfleet United in the first round replay this time last season.